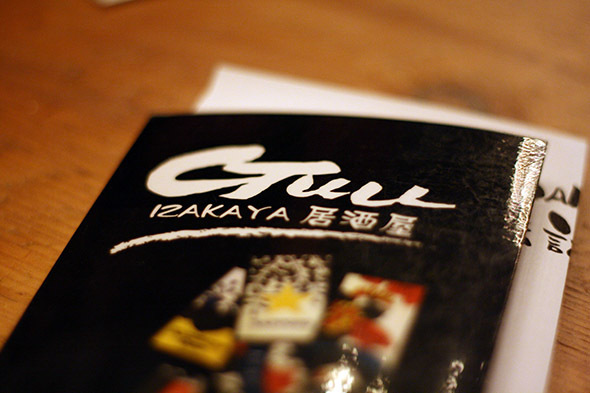 Guu Izakaya is the first Toronto outpost of the popular Guu group of restaurants from Vancouver. It's located in an otherwise unassuming strip mall on Church Street, though the striking design and warm atmosphere give it a distinctively cool vibe once inside. 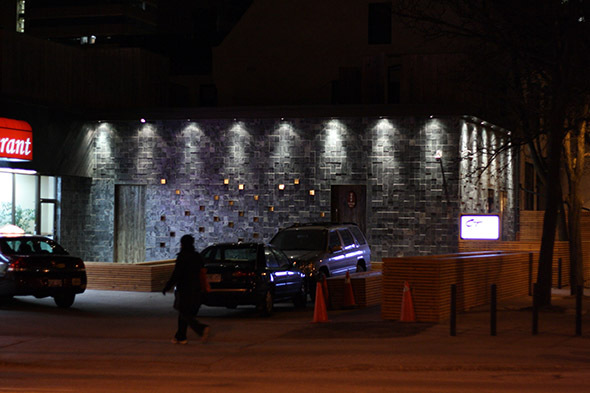 Update: This location has rebranded from Guu Izakaya to Kinka Izakaya. 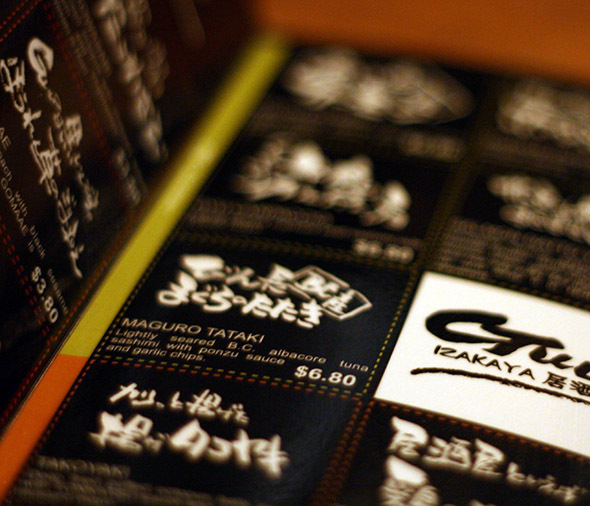 The izakaya concept is simple - small plates, raucous staff, plenty of booze - and Guu Izakaya gets it all right. 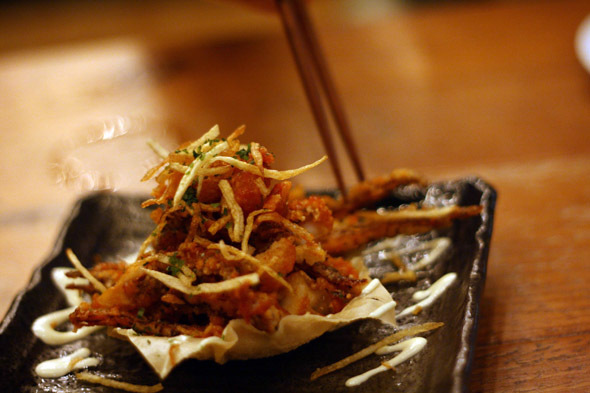 The menu ranges from classic Japanese dishes to more modern offerings, with prices starting at $4 for appetizers and ranging to $9-10 for some of the more substantial dishes. For truly adventurous eaters, they even offer one dish with natto , a Japanese delicacy made of gooey fermented soybeans that, to my unrefined western palate, smells like old gym socks and tastes only marginally better. I went down on a Monday night with a few friends to check it out, and as soon as we walked in the door we were greeted with enthusiastic shouts from the kitchen staff and servers. 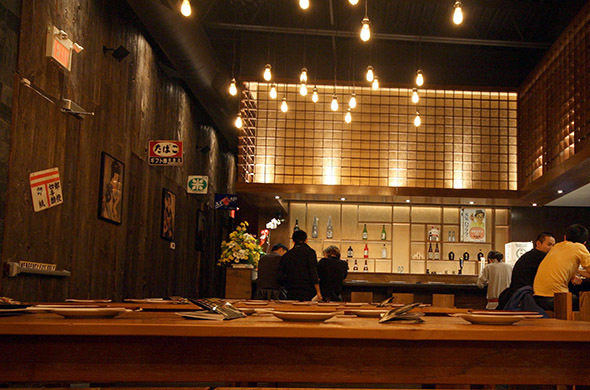 The atmosphere is lively - you might even go so far as to say "rowdy" - and the menu encourages more liveliness with a good selection of sake and shochu (sake's evil distilled cousin), and cheap mugs of Sapporo (regularly $5, on for $3 during their grand opening promotion). We had no problem getting a table when we arrived at 6:00pm, though the place soon filled up to capacity shortly thereafter. The best way to experience the food is to go with a few friends and order a bunch of dishes as most of them are designed for easy sharing. We started with some maguro tataki ($7), a plate of lightly seared tuna served with ponzu sauce and crispy fried garlic chips. 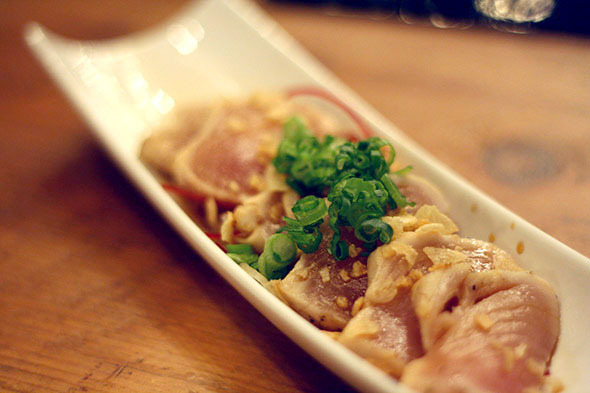 The textural contrast between the smooth, buttery tuna and lightly crispy garlic chips made for a top-notch dish that disappeared from the table in short order. The ikapiri ($6) is a plate of deep-fried squid with spicy mayonnaise, which was well cooked with a satisfying spiciness that provided a good excuse to order more beer. 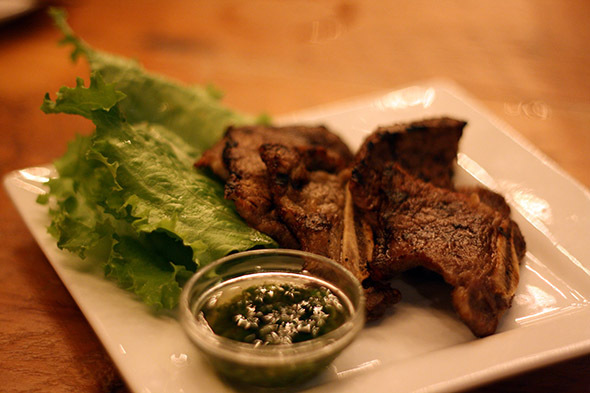 Next up we tried the karubi ($7), garlic short ribs served with a green onion sauce for dipping. The ribs were well seasoned with a bit of sweetness, but didn't quite stack up to the two previous dishes. 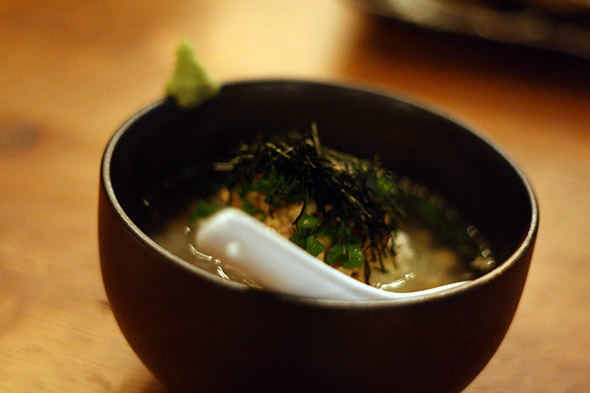 Chazuke ($6) is a traditional Japanese dish made with rice and a simple kombu dashi broth, served with a rotating selection of toppings. The topping of the day was salmon when we visited, and the dish had a nice clean seafood flavour that was the most "traditionally Japanese" of the dishes we tried. Unfortunately, there were a few tiny, dagger-sharp salmon bones in my bowl, which made eating it a bit of a chore. 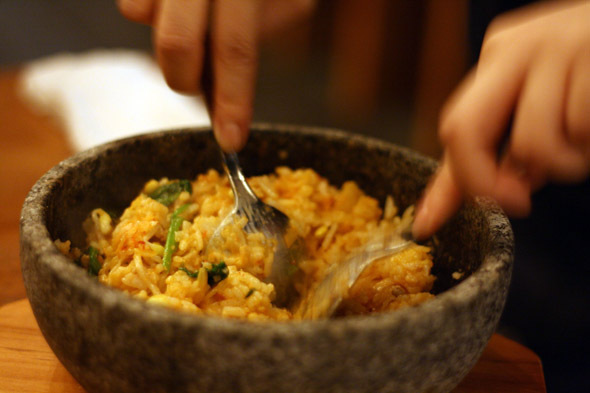 The most filling item we tried was the buta kimchi bibimbap ($8.50), a big helping of rice, pork and kimchi served in a sizzling hot stone bowl with a raw egg yolk on top. Our server gave us about two seconds to admire the presentation before digging in and mixing it all together into a big, delicious mess. When asked for his opinion on it, my otherwise articulate friend paused just long enough to mutter "good" before inhaling the rest of the bowl. 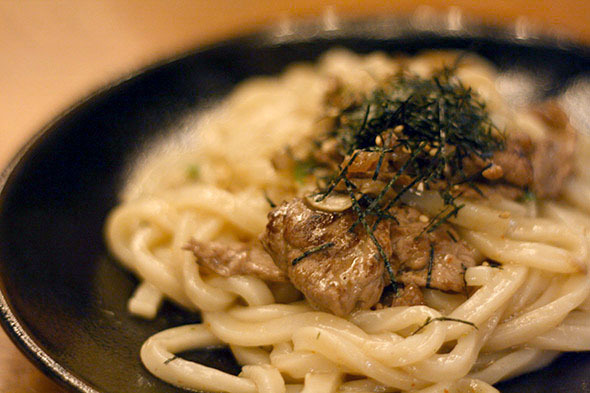 Finally, we tried the yakiudon ($8), a plate of panfried udon noodles and beef with green onions and a tasty, umami-filled sauce. Overall the individual plates are affordably priced, though if you plan on filling up on some of the more exotic dishes, it could turn into an expensive meal. 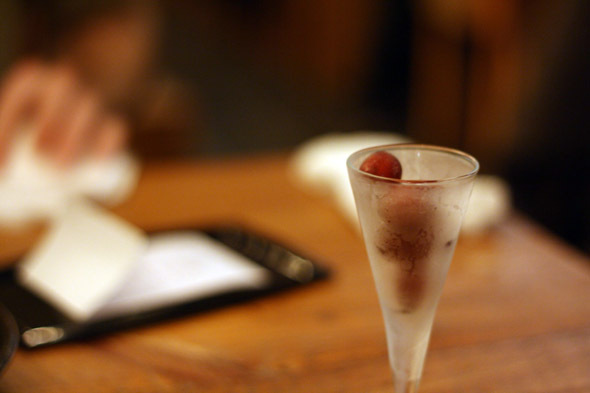 The kitchen sent over some complimentary frozen grapes to finish things off as we were heading out, which was a nice touch. The service was very friendly throughout the evening, though things got a bit hectic as the place filled up. It's tough to fault them for that though, as the chaotic energy is all part of the charm.